Heather Bell's Sewing Studio - The Farmer’s Wife ClassDuring the depression in the US, there was a magazine called the Farmer's Wife that asked their readers if they would like their daughter to marry a farmer. Picture the times, as it wasn't just the depression but a time of drought too.The letters the magazine received were varied from a big yes to an absolute no but all very moving. In 2009 Laurie Aaron Hird published this collection of letters and added a quilt block for each story, directions and a CD with templates to be printed. Marti Michell saw the book and knew that her templates would make the process much easier and more accurate. With the permission of the publisher, Marti produced a series of class notes that showed the use of her templates and additional cutting and sewing tips.I have taught this class many times. I found that I learned more about the use of templates and piecing than any other project.Do you have 2 friends interested in this class? Let me know and we can arrange a day & time that works for everyone. Generally I teach this once a month for 10 months. I have also taught this once a week for those who have a block of time when they are on vacation. It is a marathon but a great project for those who really want to learn templates. You also finish the project with a beautiful quilt.Cost $100 for 10 classes plus templates and material. This is a great scrappy project.Contact me to set up a class. During the depression in the US, there was a magazine called the Farmer's Wife that asked their readers if they would like their daughter to marry a farmer. Picture the times, as it wasn't just the depression but a time of drought too. The letters the magazine received were varied from a big yes to an absolute no but all very moving. In 2009 Laurie Aaron Hird published this collection of letters and added a quilt block for each story, directions and a CD with templates to be printed. Marti Michell saw the book and knew that her templates would make the process much easier and more accurate. With the permission of the publisher, Marti produced a series of class notes that showed the use of her templates and additional cutting and sewing tips. I have taught this class many times. I found that I learned more about the use of templates and piecing than any other project. Do you have 2 friends interested in this class? Let me know and we can arrange a day & time that works for everyone. Generally I teach this once a month for 10 months. I have also taught this once a week for those who have a block of time when they are on vacation. It is a marathon but a great project for those who really want to learn templates. You also finish the project with a beautiful quilt. Cost $100 for 10 classes plus templates and material. This is a great scrappy project. Contact me to set up a class. 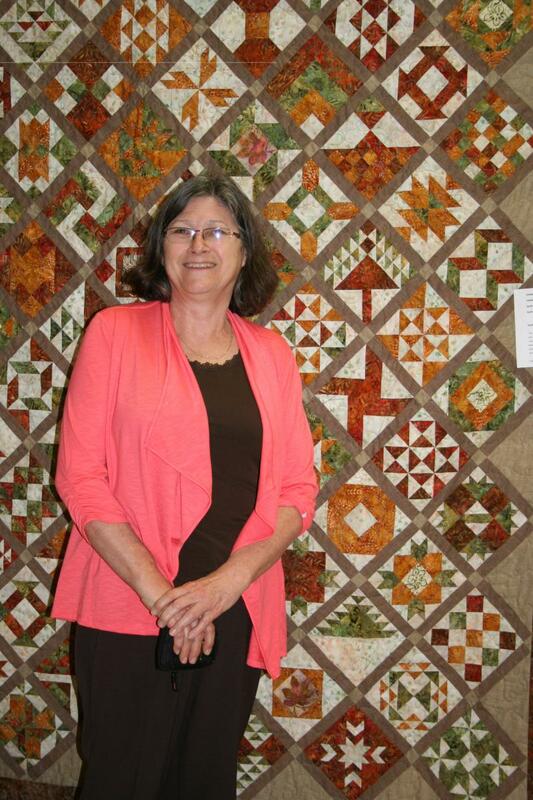 Diane Park with her beautifully finished Farmer's Wife Quilt. Copyright 2009 Heather Bell's Sewing & Dye Studio. All rights reserved.